Oh dear, Resonance are getting really good at Brahms cycles which are very fine in parts and unrecommendable in others � see my review of the Liverpool/Janowski set of the symphonies. At the start of no.1 I thought the Hallé strings seemed remarkably few, though no fewer than those Brahms�s favourite Meiningen Orchestra. The resulting clarity and forward wind may sound more "authentic" today than people thought when it was first issued. What�s more, I very much appreciated Loughran�s lean, muscular style, forwardly-moving and classical. So many performances today drag out this movement. There is a slight slackening for the contrasting material but without steering into the doldrums. When Lill enters we can hear that the approach is his as much as the conductor�s. He doesn�t go in for massive sonorities or barnstorming virtuosity, but his textures are beautifully clean while his excellent legato prevents any suggestion of dryness. In its conversational qualities, in its sense of moderation, I thought this very close to Brahms�s own language. And so, too, with the slow movement which, while grave, is allowed to flow. The finale, at a fairly moderate pace, has both purpose, character and vitality. Now I admit that some listeners may find this unchallenging. I�m prepared to defend it by saying that performances that go all out for drama, or massiveness, or heaven-storming, or whatever, often lose out on other things along the way. As a corrective to exaggeration, I shall keep this by me. After the flowing tempi of no.1 my first problem with the first movement of no.2 was the very slow tempo. As the horn started I thought this was going to be one of those performances that play this theme much slower than the rest of the movement, as a sort of motto-theme. But no, it is held pretty steady right through. Joyce Hatto�s version raised a few eyebrows in this respect (Lill is a few seconds longer still) and both I and my colleague Jonathan Woolf felt that it worked fine when she was playing but created some problems for the orchestra. Now I must say that, with Loughran at the helm, there�s no problem about the orchestra. Again he essays a lean style with clean textures and alert rhythms, while not ignoring the more romantic parts. Lill, once again, is clean and unsensational. At first I quite liked it, but gradually I felt it wasn�t adding up. Given a listless scherzo, in which the orchestra sounds unengaged and less accurate than usual, a wishy-washy slow movement and a joyless finale, I am bound to ask, why? The point is, perhaps, that the first concerto is an early work. It impresses by its classical rigour and single-mindedness, qualities which Lill and Loughran grasp well. The second is a late work, infinitely more varied, more challenging in its climaxes, more ardent in its long romantic themes, but also bubbling with humour and joi-de-vivre in its Hungarian finale. 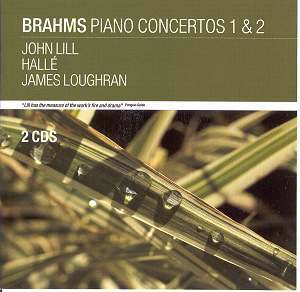 Brahms has changed and developed, but Lill and Loughran seem unaware of it. In view of the excellent symphony cycle by Loughran, I�m reluctant to blame him too much, though. What passed as rigorous and well-balanced in no. 1 makes no. 2 sound as if it were written by Parry on an off-day. It�s certainly one way of reminding yourself of what a range of mood there is in this work, to hear it played by someone who apparently hasn�t noticed, but you�d hardly want to get the record just for that. No, no.1 would get a recommendation on its own but in tandem, no way. If the famous Gilels/Jochum performances are available - they haven�t often been out of the catalogue - you�ll get the op.116 pieces into the bargain. And, if you don�t mind old sound, there�s a lot to be learnt from Schnabel on Naxos.